Marvel Comics legends Stan Lee and Steve Ditko first introduced Doctor Stephen Strange to the world in 1963—and his spellbinding adventures have wowed comic book fans ever since. Over fifty years later, the brilliant neurosurgeon-turned-Sorcerer Supreme has finally travelled from the pages of comics to the big screen, introducing a new generation of fans to his mind-bending mysticism and self-sacrificing heroics. 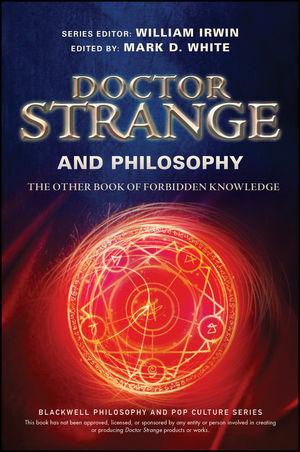 In Doctor Strange and Philosophy, Mark D. White takes readers on a tour through some of the most interesting and unusual philosophical questions which surround Stephen Strange and his place in the Marvel Universe. Essays from two-dozen Philosophers Supreme illuminate how essential philosophical concepts, including existentialism, epistemology, metaphysics, and ethics, relate to the world of Doctor Strange. Fans will find answers to all their Strange questions: How does Doctor Strange reconcile his beliefs in science and magic? What does his astral self say about the relationship between mind and body? Why is he always so alone? And what does he mean when he says we’re just “tiny momentary specks within an indifferent universe”—and why was he wrong? You won’t need the Eye of Agamotto to comprehend all that is wise within. Doctor Strange and Philosophy offers comic book fans and philosophers alike the chance to dive deeper into the world of one of Marvel’s most mystical superheroes. Mark D. White is the chair of the Department of Philosophy at the College of Staten Island/CUNY, where he teaches courses in philosophy, economics, and law. He is editor or co-editor of eight books in the Blackwell Philosophy and Pop Culture series, including Batman and Philosophy (Wiley Blackwell, 2008, with Robert Arp), and is the author of The Virtues of Captain America (Wiley Blackwell, 2014). He has also written, edited, and co-edited a number of academic books in philosophy, economics, and law, and has authored over 60 articles and book chapters in these areas. He can be found on Twitter as @profmdwhite.